Scott wrote: do we still make 6+1 gearbox? If yes im in please. Yes i have seen the dates of every [ost as i have seen lists still counting.. so.. did it ever happen?? Scott wrote: Yes i have seen the dates of every [ost as i have seen lists still counting.. so.. did it ever happen?? Don't wish to spoil the fun, but Scott please look up 1st April from a UK viewpoint on wikipedia. You may then understand why the list is still ongoing. Unless of course you know a good cheap gearbox maker in Greece who will delight us all and make some boxes whilst at the same time solving the Greek economy. 1500-200 euros sounds a bit steep. Think maybe 150-200 pounds would be more suitable for the majority on the list. But if we were to pay in wooden dollars the sky is the limit. Scott's used his bike's 15 speed on the tartmobile. How's the Anonabox going J2H from leftD? This new ZF 9-speed transmission is designed to fit FWD vehicles. Why are we farting around with only a 7 speed and a manual? Let's get real people. It's 2014. People don't want to row the gears anymore. They want autopilot, super complicated convertible top operation, and over 700 horsepower. If we can't mod our cars to meet these demands they'll become relics of a time gone past. I've never heard of a 15 spd bike, mine have 20. Mazdas do good 6 speed boxes, vastly superior to Porsche boxes according to all he exports but then again, not FWD so no use. lotos wrote: If we can't mod our cars to meet these demands they'll become relics of a time gone past. apart from the fact this is an april's fool's post. 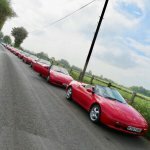 are there any 6 + 1 speed gearboxes that fit the elan ? what kind of prices are we talking about? is this something that can be fitted at home by a tenacious (and skint) DIYer? what kind of difference in fuel efficiency would be expected of a 6th gear cruising at 70mph compared to the standard gearbox ? .... but it can be done. Any Vauxhall gearbox will have the same bellhousing bolt pattern (well, anything from the right era, up to today). ....also the newer M32 box will fit. Either will give 6 speeds, but due to the lower final drive ratio, it won't really help the cruising revs in top gear - just giving you more ratios in between 1st and 6th - with the power/torque curve of the elan, I can't really see it's worth. Also, the M32 box has issues with bearing failure which can affect gearboxes with anything over 50K miles (everything you're likely to find S/H) - rebuilds are expensive (circa £600). Basically, lots of work for little end result (In my opinion). I looked into the GM F28 for my Calibra because I thought a 6th may be beneficial. It is heavier than the 5 speed box I currently have & takes different size driveshafts. I understand it was designed to work with the C20LET (turbo) engine & only just run off-boost when cruising at 70mph so the turbo spools up when you put your foot down. The Elan's 5th is set up to do exactly this too. One of the design features of the Elan is that the driveshafts are the same length. It sounds like a different gearbox would require a different driveshaft/jackshaft setup? I believe that gearbox may be the most similar replacement. It would be trial & error with gear ratios unless you do your maths very thoroughly. I’m normally not a praying man, but if you’re up there, please save me, Superman. dapinky wrote: Either will give 6 speeds, but due to the lower final drive ratio, it won't really help the cruising revs in top gear - just giving you more ratios in between 1st and 6th - with the power/torque curve of the elan, I can't really see it's worth.